Stone Mountain State Park offers some of the best waterfalls and rock outcrops in North Carolina all packed into a popular loop. The park is quite crowded in the summer given its ease of access and proximity to Winston-Salem. If you want an alternative hike that promises water, steep climbs, and isolation, then try the Mountains-to-Sea Trail (MST). From the backpack parking lot on the west side of the park, the MST and Widows Creek Trail follow Widows Creek before climbing arduously towards the Blue Ridge Parkway. Along the way you’ll pass multiple forest ecosystems and a possible abandoned moonshine site. Additionally, there is the old concrete foundation for the now gone aerial tramway. The MST meets the parkway at the Devil’s Garden Overlook offering views back into Stone Mountain State Park of the Garden Creek watershed. While not the most scenic hike, this provides a tough workout in complete isolation. As a bonus stop by Widows Creek Falls just down the road for a post-hike soak. 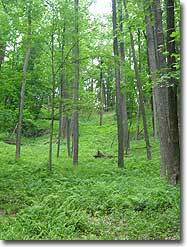 The park is accessed by taking Traphill Road off of U.S. 21 near Roaring Gap. The main park entrance is on the John P. Frank Parkway. Before starting the hike, stop by the visitor’s center for a free state park trail map. The John P. Frank Parkway winds around the north side of Stone Mountain crossing over the many creeks that feed into the East Prong of the Roaring River. The hike starts at the backpack parking area on the low west side of the park. The lot is directly off the road and has plenty of room to park. 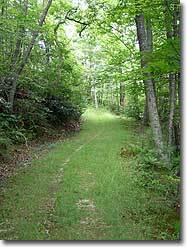 Mile 4.8 – The MST splits left off of the forest road and follows a narrow path up. On the right side of the road, the origins of Bullhead Creek are visible below in a grassy clearing. An old steel drum is sitting in the creek, this could be an old moonshine still. 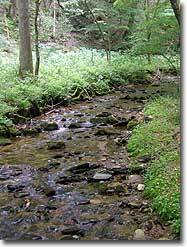 There are many sites of moonshine locations in the state park. Mile 5.9 – Trail split, summit trail is on the left (blue blaze on rocks). The trail on the right goes downhill with no blazes, unknown where this trail leads to. Mile 6.0 – Reach summit (3,740 feet) containing a large concrete foundation of the old aerial tramway. There are no views here. Turn around heading towards the MST. Mile 6.6 – Reach Devil’s Garden Overlook on the Blue Ridge Parkway. From here you can see the steep drainage of Garden Creek on the east side. There is an area with views on the other side of the parkway. Turn around and head back on the MST. 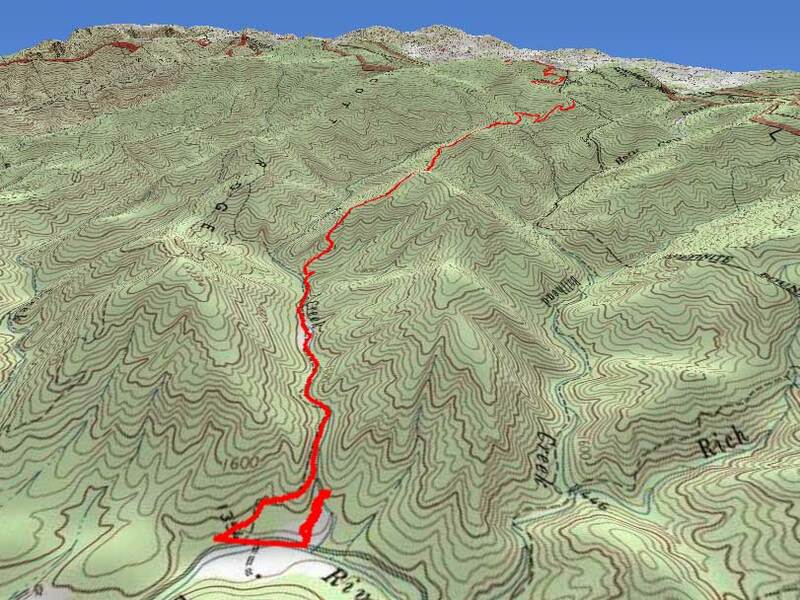 Mile 9.9 – Reach the steep section that was previously hiked up. This descent is difficult and hard on the legs. Take this descent slowly. 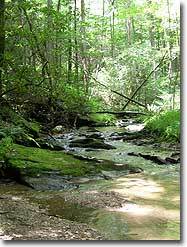 Bonus: After the pounding descent takes a toll on your feet, hop in the car and drive the short 0.15 miles north on John P. Frank Parkway to the Widows Creek Falls parking area. There is no trail connecting these two lots so it is better to take the car. 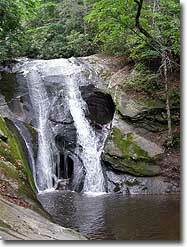 The waterfall is a beautiful 25-foot drop then the creek flows gently over multiple pools perfect for soaking your feet. The waterfall is only 0.1 miles from the parking area. I've done this hike several times since it's so close to home. Not super scenic, but always very quiet once you get on the MST and a good way to get a lot of elevation in a few hours. Love it, and thanks for the guide. I love a challenging hike, which is why I chose this trail to begin with. However, I would never consider hiking this again for several reasons. First, nearly the entire trail follows an old road bed. Maybe some like this type of trail, but I don't care for trails that allow you to hike several people side by side as I prefer more intimate trails. I also don't like being able to see several hundred feet ahead at any given time, which happened quite often. The second reason is the elevation gain is at several points is absolutely insane and relentless. I was literally zigzagging within the wide path to lessen the incline at certain points. So much for switchbacks. The farther I climbed the more I dreaded the descent which was so bad I was unable to hike the next day because my knees were trashed. There wasn't nearly enough reward for the punishment my body took. One positive I will mention was the woods were beautiful through the Rhododendron, while it lasted.